It’s official, you’re helping the American Cancer Society to save lives from breast cancer. Your donation of $ has been applied towards ’s fundraising goal. See how your donation will make a difference here. We will also email you to let you know if your donation qualifies for Employer Gift Matching. If so, the email will contain instructions to help you complete the process. Tell your friends and family you donated and encourage them to do the same. 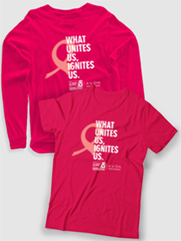 Or even better, have them join you in signing up for a Making Strides Against Breast Cancer Walk. the Making Strides General Fund?